This test determines underlying problems linked to gastrointestinal function. Since there are many factors that can contribute to GI function, treatment often first requires a measurement of function in the intestinal lining. Our Intestinal Permeability test from Genova Laboratory allows our office to assess how well or poorly nutrients are absorbing through the intestinal wall, how much inflammation is present, and what will be the best course of action. This test directly measures how well two non-metabolized sugars permeate the intestinal mucosa. The small intestine has the paradoxical dual function of being a digestive/absorptive organ as well as a barrier to permeation of toxic compounds and macromolecules (1-3). Either one of these functions may be disrupted by various mechanisms, resulting in local as well as systemic problems. The distal intestine contains numerous dietary and bacterial products with toxic properties. These include viable bacteria, bacterial cell wall polymers, chemotactic peptides, bacterial antigens capable of inducing antibodies which cross-react with host antibodies, and bacterial and dietary antigens which can form systemic immune complexes (4). Abnormalities of the immune or mechanical barriers lead to increased uptake of inflammatory luminal macromolecules and pathogenic bacteria. With clinical intestinal injury, mucosal absorption of normally-excluded substances increases dramatically. Intestinal inflammation enhances the uptake and systemic distribution of potentially injurious macromolecules (5). Peters and Bjarnson, in an excellent review of the uses of permeability testing, noted: "Measurement of intestinal permeability will play an increasing role in clinical investigation and monitoring of intestinal disease." Increased permeability of the intestinal mucosal barrier appears to correlate with a number of frequently seen clinical disorders, while decreased permeability appears as a fundamental cause of malnutrition, malabsorption, and failure to thrive. Several of these disorders are discussed in detail in the following sections. Increases in permeability have consistently been reported in conjunction with small bowel inflammation. In 1972, Shorter proposed that a breach of the intestinal barrier is a fundamental culprit in the development of intestinal inflammation. Now, most hypotheses about the pathogenesis of Crohn's disease emphasize the prime importance of mucosal integrity in maintaining a healthy state and suggest that increased mucosal permeability underlies the inflammatory process. Permeability studies show Crohn's disease to be more extensive than is sometimes apparent when using macroscopic approaches (9). Pearson showed a sixfold increase in permeability in people with Crohn's disease (10). When patients with Crohn's disease were placed on an elemental diet, their permeability improved significantly, coinciding with marked clinical improvement. The concept that the underlying etiology of inflammatory arthritides (including rheumatoid arthritis) is related to pathology in the gut has become more popular among researchers. All material that traverses the mucosa is inspected by the immune system, and it is here that the immune system may have its greatest antigenic exposure. Increased gut permeability can permit exogenous antigens to enter the systemic circulation. If the antibodies generated towards gut antigens cross-react with the body's own immunologically similar tissues, the resulting process may manifest itself as an autoimmune disease (14). Studies have demonstrated that patients with ankylosing spondylitis, rheumatoid arthritis, and vasculitis, have increased intestinal permeability, which may be an important factor in the pathogenesis of these disorders (13,15-17). There is a major association between enteric infection and Reiter's syndrome or reactive arthritis. Intestinal infections of Shigella, Salmonella, Yersinia, and Campylobacter are known to cause this type of disorder. It is suggested that the arthritis from these infections may be due to tissue deposition of circulating immune complexes arising from increased permeability of source antigens. Darlington, after studying the influence of diet on arthritis, concluded that: "The mechanism by which fasting leads to improvement of rheumatoid arthritis may be a reduction in gut permeability." Findings by Mielants show that in spondylarthropathies, the joint disease is triggered through the gut. Development of food allergies depends on heredity, intestinal permeability, immune responsiveness, and exposure to food. "Food sensitivity" is used to refer to all adverse reactions to the ingestion of food, including allergic, idiosyncratic, toxic, metabolic, and pharmacological. Food "allergies" are distinguished by being mediated by an immunologic mechanism, consistently reproduced by blinded food challenge and causing functional changes in target organs. In general, the intestinal tract provides an effective barrier against the excessive absorption of bacteria, food antigens, and large molecules. When this mechanism is ineffective, antigens are allowed to enter the system in excessive amounts, which leads to sensitization of the immune system in some individuals. Increased permeability is implicated in Type I, Type III, and Type IV allergies. Andre, in a study of food allergy, concluded that "evaluation of intestinal permeability provides an objective means of diagnosing food allergy and assessing the effectiveness of anti-allergic agents." A number of studies by Andre showed that people with food allergy had increased permeability during a fasting state and that the permeability further increased after ingestion of an offending allergen. Andre concluded that using lactulose and mannitol to measure intestinal permeability allowed objective diagnosis of food allergy. Andre also observed that permeability increases even after ingestion of an amount of food that is not large enough to cause a clinical reaction. Magnusson studied children with cow's milk allergy and found that the majority of children displayed changes in permeability after challenge and that pre-treatment with sodium cromoglycate diminished the changes (26). Cromoglycate may stabilize mast cells and IgE producing plasma cells in the lamina propria of the gut and thus reduce the local inflammation which contributes to the increased intestinal permeability. Urticaria and atopic dermatitis can be caused by the ingestion of certain foods. Andre showed that people with atopic dermatitis and those with urticaria demonstrated increased permeability when given an oral challenge of food that provoked symptoms. Intestinal permeability has been studied in patients with coeliac disease. In children with coeliac disease, Pearson demonstrated a significant alteration in permeability due to reduced absorption (10). After exposure to a single oral dose of gluten, the intestinal permeability of people with coeliac disease became transiently abnormal, returning to normal within one week. Hamilton concluded that the Sugar Ratio test is of value in assessing the response to gluten withdrawal and in monitoring patients who are already established on a gluten-free diet by detecting dietary lapses and "non-responders." In another study, Bjarnason strongly suggested that a persistent functional and/or structural abnormality of the small intestine is associated with coeliac disease along with possible etiological implications. In certain disease states of the small intestine, such as gluten-sensitive enteropathy, permeability to large molecules may increase while permeability to small molecules decreases. The explanation of this apparent paradox lies in the different routes of entry for readily absorbed, water-soluble molecules (such as mannitol) and normally excluded molecules (such as lactulose). Transcellular uptake of mannitol relies on properties of the luminal cell membrane, a relatively huge area compared to the minute intercellular junctional complexes or "tight junctions." Increased porosity of tight junctions has little effect on mannitol uptake, but villous atrophy decreases mannitol diffusion into mucosal cells. Thus, decreased transcellular permeability to small, water-soluble molecules may lead to malnutrition. In contrast, increased porosity of junctional complexes may lead to increased uptake of food antigens and bacterial toxins, correlating with increased susceptibility to food allergies and autoimmune conditions such as rheumatoid arthritis. Numerous studies have shown that Nonsteroidal Anti-inflammatory Drug (NSAID) usage disrupts the intestinal barrier function and causes increased permeability. 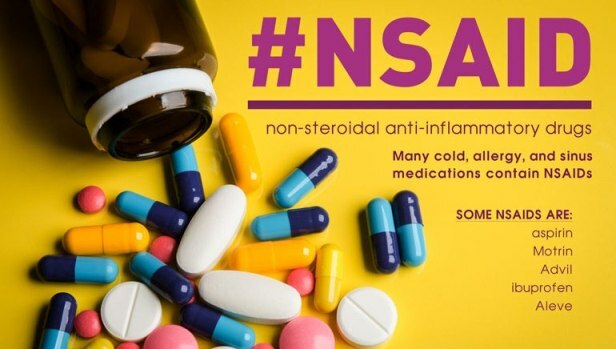 This is of particular importance in those with arthritis who are being treated with NSAIDs because the increased permeability may be a key factor in their disease's progress. The hypothesis that various bacterial and viral intestinal infections can cause altered permeability is well supported. Studies show that host responses to infections are related to increased passage of micro-organisms and endotoxins into the systemic circulation. 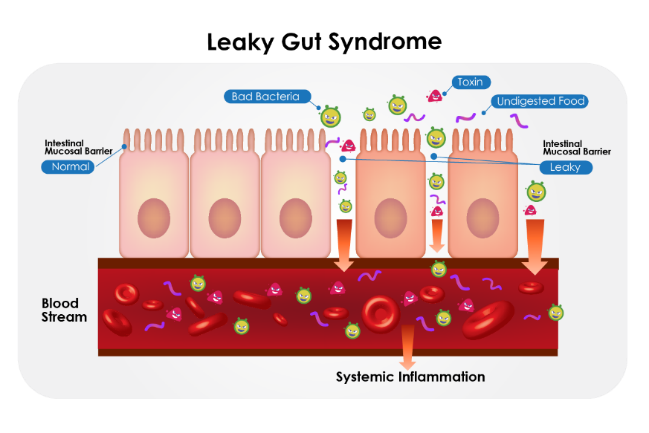 Several authors have claimed that this breach of the mucosal barrier is an important aspect in both acute and chronic systemic effects of intestinal infection. Deitch reported that bacteria translocate across the mucosal barrier and cause systemic infections and various immunologic sequelae (37). Factors that promote translocation of bacteria include disruption of the ecologic balance of normal indigenous microflora (dysbiosis), bacterial overgrowth, impaired immune defense, trauma, and endotoxemia. Intestinal permeability was studied recently in patients with well-characterized cystic fibrosis or with pancreatic insufficiency. Compared to controls, lactulose permeation increased with exocrine pancreatic insufficiency. The degree of increased intestinal permeability correlated with the level of duodenal trypsin and with the degree of undigested fat in the stool. The authors suggested that urinary lactulose might be useful in evaluating exocrine pancreatic function. Recent studies show that damage to the small intestine mucosa (resulting in decreased permeability) is linked to failure to thrive and poor growth rates in children. The intestinal damage is typically a result of infection and resulting diarrhea. A number of very interesting studies were performed by Bjarnason with alcoholic individuals. These studies showed that alcoholics had elevated intestinal permeability. In many people, the abnormality persisted for up to two weeks after cessation of drinking. This increased permeability may account for some of the extra-intestinal tissue damage common in alcoholics. Bode reported that gut-derived endotoxins might play a role in the initiation and aggravation of alcohol-induced liver disease. In an intriguing study on aging, Hollander concluded that "the intestinal barrier to the absorption of potentially harmful environmental substances may be less efficient in aging animals." Various studies show that aging rats have diminishing capacity to prevent larger sized molecules from penetrating the intestinal mucosa, possibly allowing antigenic or mutagenic compounds to reach the systemic circulation. Cytotoxic treatment has been shown to decrease permeability, a possible factor in malnutrition of cancer patients. Some of the noninvasive permeability techniques are simple and reliable such that they may be utilized to assess many clinical conditions. The permeation of water-soluble molecules through the intestinal mucosa can occur either through cells (transcellular uptake) or between cells (paracellular uptake). Small molecules (glucose, mannitol, etc.) readily penetrate cells and passively diffuse through them. Larger molecules such as disaccharides (e.g. lactulose) normally are excluded by cells. The rate-limiting barrier in this case is the tight junction between cells. Thus, tight junctions help maintain epithelial integrity. The Intestinal Permeability test directly measures the ability of two nonmetabolized sugar molecules—mannitol and lactulose—to permeate the intestinal mucosa. Mannitol, a monomer, is readily absorbed and serves as a marker of transcellular uptake. Lactulose, a dimer, is only slightly absorbed and serves as a marker for mucosal integrity. To perform the test, the patient mixes pre-measured amounts of lactulose and mannitol and drinks the challenge substance. The test measures the amount of lactulose and mannitol recovered in a 6-hour urine sample. Low levels of mannitol and lactulose indicate malabsorption. Elevated levels of lactulose and mannitol are indicative of general increased permeability and "leaky gut" phenomena. Permeability to lactulose can increase, indicative of "leaky gut," while permeability to mannitol may decrease, indicative of malabsorption of small molecules. The lactulose/mannitol ratio is a useful parameter. An elevated ratio indicates that the effective pore size of the gut mucosa has increased, allowing access (to the body) of larger, possibly antigenic molecules. The Intestinal Permeability test requires an overnight fast. Nothing, including water, should be consumed after 11 p.m. Two urine samples are required. The first is a random urine pretest sample. The second is a sample drawn from a 6-hour urine collection after ingesting the challenge drink. As always in our clinic, once the laboratory tests are received and evaluated, a complete oral and written explanation are provided to our patients. A detailed plan will be outlined to correct the condition using completely natural therapies. 2 Crissinger KD, Kvietys PR et al. J Int Med 1990; 732(1):145-54. 3 Madara JL. Am J Pathol 1990; 137(6):1273-81. 4 Madara JL, Nash S et al. Gastrointestinal Pathol;9:306-24. 5 Olaison G, Sjodahl R et al. Scand J Gastroenterol 1990;25(4):321-28. 6 Peters TJ, Bjarnson I. Can J Gastroenterol 1988;2(3):127-32. 7 Pironi L, Miglioli M et al. Dig Dis Sci 1990;35(5):582-88. 8 Shorter RG, Huizenga KA et al. Dig Dis 1972;17:1024-32. 9 Ukabam SO, Clamp JR et al. Digestion 1983;27:70-74. 10 Pearson AD, Eastham EJ et al. Br Med J 1982;285(6334):20-21. 11 Sanderson IR, Boulton P et al. Gut 1987;28(9):1073-76. 12 Bjarnason I. J Rheumatol 1990;17(20):38-41. 13 Rooney PJ, Jenkins RT et al. Clin Exp Rheumatol 1990;8(1):75-83. 14 Bjarnason I, Peters TJ. Gut 1989; (30 Spec No):22-28. 15 Mielants H, De Vos M et al. J Rheumatol 1991;18(3):394-400. 16 Katz KD, Hollander D. Bailliere's Clin Rheumatol 1989;3(2):271-84. 17 Smith MD, Gibson RA et al. J Rheumatol 1985;12(2):299-305. 18 Lahesmaa-Rantala R, Magnusson KE et al. Ann Rheum Dis 1991;50(2):91-94. 19 Inman RD. Rheum Dis Clin N Am 1991;17(2):309-21. 20 Darlington LG, Ramsey NW. Lancet 1991;338:1209. 21 Mielants H. Clin Exp Rheumatol 1990;8(5):523-24. 22 Butkus SN, Mahan LK. J Am Dietetic Assoc 1986;86(5):601-08. 23 Schreiber RA, Walker WA. Mayo Clin Proc 1989;64(11):1381-91. 24 Andre C, Andre F et al. Ann Allergy 1987;59(II):127-30. 25 Andre C, Andre F et al. Allergy 1989;44(9): 47-51. 26 Falth-Magnusson K, Kjellman N-IM et al. Clin Allergy 1986;16(6):543-51. 27 Paganelli R, Fagiolo U et al. Ann Allergy 1991;66:181-84. 28 Hamilton I, Cobden I et al. Gut 1982;23(3):202-10. 29 Bjarnason I, Peters TJ et al. Lancet 1983;1(8320):323-25. 30 Cobden I, Rothwell J et al. Gut 1980;21: 512-18. 31 Bjarnason I, Williams P et al. Gut 1986;27(11):1292-97. 32 Bjarnason I, Zanelli G et al. Scand J Rheumatol 1987;64:55-62. 33 Jenkins AP, Trew DR et al. Gut 1991;32(1): 66-69. 34 Serrander R, Magnusson KE et al. Scand J Infec Dis 1986;18(5):409-13. 35 Isolauri E, Juntunen M et al. J Ped Gastroenterol Nutr 1989;8(4):466-73. 36 O'Dwyer ST, Michie HR et al. Arch Surg 1988;123(12):1459-64.